Managing Black Carbon from Transport: Better Air, Better Climate! From Left: Mr. Daniel Bongardt (Project Director, GIZ), Mr. Tang Dagang (Director, Vehicle Emission Control Center, China), Dr. Anup Bandivadikar (Programme Director, International Council for Clean Transportation, India), Prof. 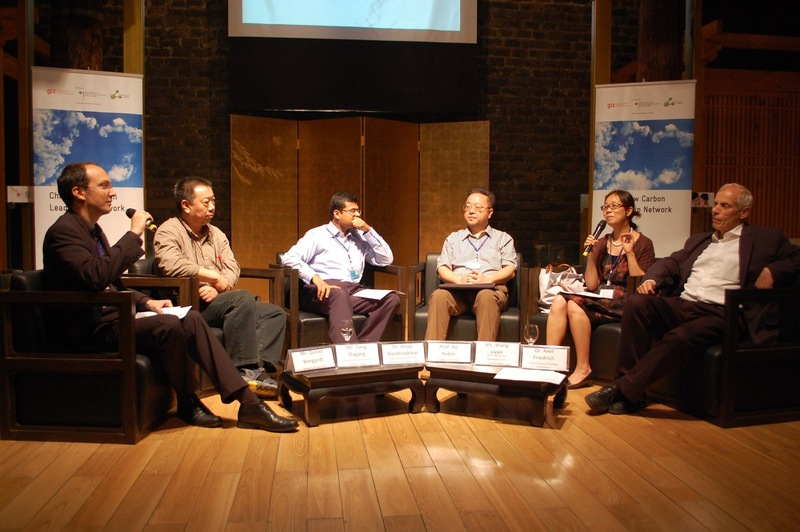 He Kebin (Division of Air Pollution Control, Tsinghua University), Ms. Wang Liyan (Programme Manager, Swiss Agency for Development and Cooperation), Dr. Axel Friedrich (former Head of Transport and Noise Division at the German Federal Environmental Protection Agency). While much of the climate narrative is about reducing CO2 emissions, the significance of black carbon is often overlooked. Black carbon, or soot, is the second largest contributor to climate change behind CO2. At the same time, black carbon emissions have detrimental impacts on peoples’ health. The availability of diesel with low sulfur content is seen as the most important driver in reducing black carbon emissions. In China, incentivizing better fuel refining capacity, coupled with installing diesel particulate filters on vehicles would result in significant economic net benefits, from both health and climate perspectives. The following is an edited synthesis of discussion that took place at the event among panelists (around 1 hour) and open Q&A with participants (45 mins). As per convention, individual’s comments are not attributed. • How is black carbon from Transport produced? Black carbon is largely emitted from fuels with high particulate content, including sulphur. Most of the black carbon from transport comes from diesel engines, (light commercial vehicles, passenger cars, buses, trucks). In China, there are more than 15million diesel vehicles, estimated at producing over 600,000 tonnes of particulate matter each year, of which 80% is estimated to be black carbon. In contrast to CO2, which stays in the air for centuries, black carbon only remains in the atmosphere for several weeks. Abating black carbon therefore results in immediate co-benefits – improving local air quality, and mitigating climate change. • What are the health effects of black carbon? While PM2.5 receives a lot of attention in China, it is only a small part of the air quality issue. Emissions from diesel range from PM10 to PM450 and health studies show these particles penetrate deep into human lungs, through the lung wall, and enter the blood stream causing heart attacks and lung cancer. It is estimated that 5 million people are killed by air pollution in China every year. At the time of this discussion, a measurement of particulate concentration was taken inside the theatre. The room recorded a reading of 10,000 particulates per cm3. This is the particulate concentration on a highly travelled part of a German Autobahn. Outside in Beijing on the same day the reading was 30,000 particulates per cm3. • What are the climate change effects of black carbon? From a climate change perspective, black carbon warms by 1) absorbing sunlight, thus generating heat in the atmosphere; and 2) winds carrying soot particles on to arctic ice and Himalayas, where they settle on ice and snow, stopping the reflection of sunlight which increases the melting rate, and further accelerates global warming. • What is happening in China? The content of sulphur in China’s diesel is currently very high at 350 parts per million (ppm). Like many other developing countries, China’s vehicles are converting to Euro 3 (ppm content standard) fuel norms. The Chinese government is planning to introduce 50 ppm diesel (Euro 4) by 2015 and 10ppm diesel (Euro 5) by 2018. • What can China learn from the international experience? Experience from Europe shows reducing black carbon emissions can be effectively achieved by undertaking two things: 1) using ultra-low sulphur fuel, 50 ppm content or less, and 2) installing diesel particulate filters (DPF) on vehicles. Together, these two actions have been proven to eliminate all the PM 2.5 and black carbon emissions from vehicles. However, the deployment of DPF without 50 ppm sulphur diesel would be ineffective as the DPFs can only work with 50ppm diesel or less. If China can make a move to at least Euro 4 for passenger vehicles, that will enable effective deployment of DPFs. • What international cooperation is taking place between China and other countries? Among other cooperation initiatives, China and Switzerland are developing pilot programs in some Chinese cities to introduce DPF technology and low sulphur content fuels for buses and construction machines. • Are the solutions for mitigating black carbon economically viable？There is overwhelming agreement that they are. 99.9% of black carbon can be removed very efficiently. Economic cost benefit analysis studies and results from Germany demonstrate that reducing black carbon emissions by 99.9% results in a 50% net benefit to the economy (or, for every 10yuan spent on abating black carbon, 15yuan is returned to the economy). • What are the barriers in China to moving quickly to tackle black carbon? While it is acknowledged that low sulphur diesel (50ppm or less) must be used to enable effective use of the DPF technology, the main obstacle in most parts of the developing world is investment in refining capacity for low sulphur. Sulphur is present in the oil and must be extracted out, so it represents a cost to the refiner (around 2-3 cents per litre). It is important therefore to have innovative financing mechanisms, to incentivize investment in refining technologies. • What are the barriers at the city level? Ensuring as many vehicles can be retrofitted with DPF as soon as possible so that when Euro 4 fuels and above arrive, the full effects are achieved. Funds must be available to achieve this. Port cities should receive special attention due to: 1) the large amount of black carbon emissions from ships; and 2) the concentrated number of diesel trucks going to and from the port. It takes 18,000 trucks to load or unload one container ship, significantly contributing to black carbon emissions near the port. • The diesel used on sea ships is considered the worst quality available, essentially waste from the refineries. Can fuel refiners do anything to reduce sulphur content from ships? The International Maritime Organization has taken steps to reduce the sulphur content of maritime fuel from 10,000ppm to below 1,000ppm. However, the cost of further addressing the problem seems feasible. For instance, it takes 60 Euro cents to transport an iPad from China to Europe. Reducing ship diesel ppm to around 50ppm would only increase transport costs by 3 Euro cents. • Can we replace diesel with compressed natural gas (CNG)? Depending on security/price of supply, the use of CNG would certainly reduce black carbon emissions; however, proper installation is still required to avoid increasing Nitrous Oxide (NOX) emissions. Further, methane emissions can be higher from CNG so scenarios where one problem is mitigated, but another created, must be avoided.